The Aparthotel Labuznik Karlovy Vary is located along the city's main street. This places it in close proximity to many of the most popular attractions that the city has to offer including the famous spas that draw travelers from around the world. There are also restaurants and shops located nearby this hotel. Karlovy Vary also has many historical sites to explore. From the Aparthotel Labuznik Karlovy Vary and Karlovy Vary, it is an approximately two-hour drive to the nation’s capital of Prague. 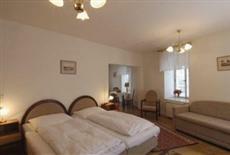 The Aparthotel Labuznik Karlovy Vary provides apartment-style accommodations. In total, there are seven of these apartment units available and they are distributed over the four floors of this building. All of them are air-conditioned. The Aparthotel Labuznik Karlovy Vary does not contain a spa nor does it contain any significant onsite amenities. This facility is essentially self-catering but guests of this facility are welcome to make use of the amenities at a nearby hotel which is a sister establishment and which provides extensive services including a restaurant and a spa which is available to guests.